DARKEST HOUR is a film about the first month of Churchill's Prime Ministership and what is often referred to as the Cabinet War Room Crisis. It's a very compressed account of a Conservative Party at odds with its leader. Neville Chamberlain, the previous Prime Minister, discredited by his association with the policy of appeasing Hitler, is judged unfit to continue by both his party and the opposition. The Conservatives must therefore find a Prime Minister who will unite Parliament. Lord Halifax is popular with his own party, the King, and the House of Lords, and like many aristos of the time, scarred by World War One, is determined to make peace. Churchill seems to stand alone in believing that one cannot negotiate with a tyrant, but as the British forces are encircled at Dunkirk, seems to lose faith in his own judgment. This is his Darkest Hour. And yet, by interacting with the Honest Plucky British Public on a tube train, and with the fortification of his King who is now "bloody angry" that he'll have to go into exile in Canada, Churchill rediscovers his own confidence. He outmanoeuvres Halifax, who is threatening to resign and bring down the government, by calling a wider meeting of his Outer Cabinet and then addressing Parliament directly. In the words of Halifax, Churchill "mobilises the English language". The decision to focus on this period, and the script, are the work of Anthony McCarten (THE THEORY OF EVERYTHING). And there is much to love in this tense, compressed approach of focussing at the very real ethical dilemma of prosecuting war no matter what the cost. We know that Churchill had history on his side, but the film does a good job of showing his faults - the drinking, past military blunders - as well as the humanity of Halifax's concern for wasted human life. After all, it's easy with the benefit of hindsight to know that the Allies would prevail, but in 1940 Britain was alone, America was out of the war, and Western Europe had capitulated. It's hard for us to sympathise with appeasers having not lived through the horror of World War One. I also love the fact that this script focusses very much on Churchill's use of language. In his Darkest Hour, words fail him - this is a signal that he's doing the wrong thing. That said, there's a little hokeyness mixed in with the otherwise excellent writing. Did we really need Churchill on a tube? In front of the lens, I loved everything about the production design - the claustrophobia of the cabinet war rooms symbolising how trapped Britain was; the oppressive grandeur of Buckingham Palace hemming in the King; contrasted with the homely security of 10 Downing Street and faithful wife Clemmie. I also loved the decision to match the ethical quandary with a visual darkness and chiaroscuro that's more extreme than anything I've seen in recent years. Kudos to cinematographer Bruno Delbonnel (INSIDE LLEWYN DAVIS) for pulling it off. And the acting is of course superlative. Kristin Scott Thomas manages to make Clemmie more than a caricature hairstyle and shows the real sacrifices she has made. Stephen Dillane gives real humanity to Halifax and makes it clear that his decisions are not founded in self-interest. I very much liked Ben Mendelsohn as King George V - he gets the sense of conflict and duty. But it's Gary Oldman who is rightly winning praise for his absolutely seamless transformation into Churchill. We live in an era of Churchill's - Brian Cox, John Lithgow - but none have benefited from the prosthetics, or quite nailed the vocal pattern. His Churchill is a great man - and greater still for his vulnerability and doubt. He is funny as well as wise, and I must confess I was in tears during his final speech to the House of Commons. So overall, there is a great deal to admire in Joe Wright (ATONEMENT)'s new film. As ever he gives us a fluid camera and camera moves that draw attention to themselves. He loves showing us complex interiors as he draws his camera forward on a single character weaving through the landscape. 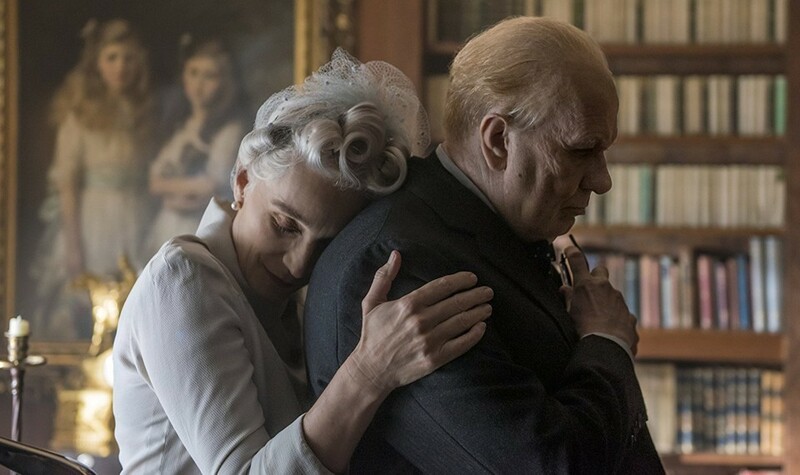 At times, I felt the flourishes were just too much, or without purpose, but in general in makes what could've been a more stodgy period drama (think THE KING'S SPEECH) more dynamic, tense, and high stakes. DARKEST HOUR has a running time of 125 minutes and is rated PG-13. The film played Telluride, Toronto and Turin 2017. It opened last year in the USA, China and France. It opened earlier this year in Hong Kong, Israel, Singapore, Taiwan, Australia, Brazil, the Czech Republic, Kuwait, Portugal and Slovakia. It opens this weekend in Spain, the UK and Ireland; on Jan 18th in Austria, Germany, Greece, Hungary, Italy, South Korea, the Netherlands, New Zealand, Russia, Ukraine, Bulgaria, Finland, Indonesia, Mexico, Romania and Vietnam; on Jan 25th in Denmark and Poland; on Jan 31st in Malaysia; on Feb 2nd in Estonia and Sweden; on Feb 14th in Philippines and Argentina and on Feb 23rd in Turkey.